In June, I was in Portland for the Historical Novel Society's conference, and of course I had to visit the Portland Art Museum. The museum is filled with stunning art work, both ancient and contemporary, and I highly recommend it. At the time, they were showing an exhibit titled, "Reunited: Francescuccio Ghissi’s St. John Altarpiece," which brings together eight parts of a segmented altarpiece and adds a ninth recreated panel to provide the complete image. Gorgeous, right? But what most caught my attention was the display on just how the ninth altarpiece was recreated. Dutch conservation specialist Charlotte Caspers used both the techniques and the materials that the 14th century artist would have used originally. My geek radar started flashing all over my mental screen. See, my debut novel is about a 17th century Dutch artist, and I spent a lot of the time trying to research just what sorts of materials she would have used, and what her process would have been like. So resources like this exhibit are like a glass of Malbec wine to me. Which is to say, irresistible and slightly intoxicating. In case anyone else out there is curious about how artists hundreds of years ago made their paints, I figured I'd share the photos I took. Many thanks to the Portland Art Museum for putting this exhibit together! Obviously, paints didn't come premade in tubes back then, so artists had to make their own. Some recipes were fiercely guarded; others might have been so widely known as to not have merited writing down (to the dismay of historical novelists everywhere). But generally artists needed at least two components -- pigment and a binding agent to get the powder to coalesce into paint. In the photo above, you can see an eggshell. Egg is one possible binding agent, and I guess that's what they used in the 14th century, though it doesn't work as well as others that later artists used. In my novel, as in real-life 17th century Haarlem, the artists preferred to use linseed oil as their binding agent. 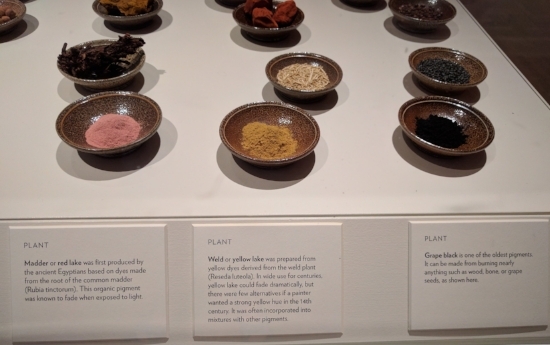 Three plant-derived pigments: Madder (red lake), weld (or yellow lake), and grape black. Three fabricated pigments: Verdigris, lead tin yellow, and lead white. Hopefully you can see in the photos above the original materials used to create the pigments. Two mineral pigments: Yellow ochre and brown earth. There's certainly a lot more to recreating materials and technique than what I've provided here. In some ways, historical fiction is a bit like art conservation (and recreation). We take hints and guesses about the past, accumulating enough evidence until we can connect the dots and create a convincing world. Art conservationists certainly know a lot more than I do about 14th century or 17th century art (that's putting it mildly), yet I'm willing to guess there are still things they don't know. So here's to trying to fill in the dots, whether it's through research or imagination.